Anna is an intelligent, driven teenager who wants nothing more than to pursue her dreams. Harrison is equally intelligent, but in specific areas, and he works harder at things that come naturally to Anna. Anna struggles with an over-bearing judge for a mother who tries to direct her life and college choices. Harrison struggles with high functioning autism and is regularly challenged by high school social expectations and experiences. Through Anna’s desire to pad her resume for college applications, Harrison’s mother’s wish for him to learn to cope with societal norms, and the existence of a “Best Buddies” program at their high school, Anna and Harrison become partners. Anna is gentle and understanding and researches Harrison’s needs. Harrison is courageous and willing to try a few new things with his strong support network: his mother, father, brother, therapist, guidance counsellor, friend and Anna. 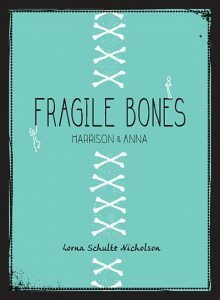 From the first day of school to the Halloween dance, Fragile Bones details Anna and Harrison’s experiences and gives the reader insight into what it’s like to be a teen with a dream. Through all the ups and downs, Harrison and Anna’s voices are strong, clear and magnetic. This a real page turner full of honest truths about life, high school and the human struggle. Hopefully after reading this book, more students, parents and school staff will push for and support Best Buddies programs in both high school and elementary grades. Classroom Connections: This book is a great way to reinforce the idea that every human being is unique and we all bring something valuable to our communities. Used as a read-aloud, this would be a great way to sup-port diversity and inclusive education. Reading Comprehension Strategies: Transforming, Making Predictions, Inferring.